Englewood, Colo.— Mike Utley, College Football Hall of Fame inductee, former NFL player, and former Craig Hospital patient, will return to Craig Hospital for the first time in many years on Friday, April 29. He is available for one-on-one interviews on Friday afternoon by appointment. On Saturday evening, Utley will be honored at the Craig Hospital PUSH dinner. At the event, Utley will be awarded the Inspiration Award for his determination, advocacy, and commitment to serving as a positive and influential role model to those who have suffered a traumatic brain or spinal cord injury. On November 17, 1991, the Detroit Lions’ offensive guard was paralyzed during an NFL game against the Los Angeles Rams at the Silverdome in Detroit, MI. Utley’s courageous “Thumbs Up” gesture as he was carried from the field has come to symbolize his fighting spirit. Following his rehabilitation at Craig Hospital, Mike founded the Mike Utley Foundation. The Foundation supports select research, rehabilitation and education for spinal cord injuries. Over the years, the Mike Utley Foundation has given $250,000 to Craig Hospital to build the terrain park for wheelchair skills training, provide patients with vital equipment, support research, patient education, therapeutic recreation and more. 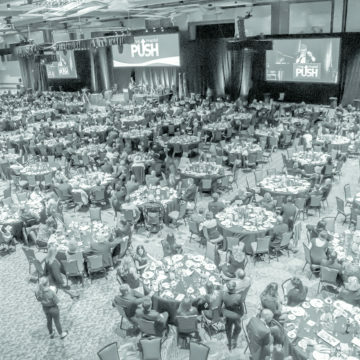 The PUSH gala event raises money to support Craig Hospital’s Programs of Excellence and research. Also at the dinner, South Metro Fire Fleet Services Bureau Chief Brian Brown and his wife Alice will accept the Dave and Gail Liniger Spirit of Craig Award. In 2006, Brian sustained a severe traumatic brain injury in a cycling accident on Mt. Evans. His rehabilitation at Craig made it possible for him to return to work 11 months post-injury. Brian and Alice are passionate Craig supporters and volunteers. They founded the Racing For Hope Cycling Classic, a competitive race to raise money for Craig. By Appointment. Please call or text Jordan Ames, Craig Hospital Foundation Communications Manager, at 720-231-0267 if you would like an appointment. Cocktail Hour/Interview availability: 5:30-7 p.m.
Brian and Alice Brown video and award presentation roughly 8:05 p.m.
Mike Utley video and award presentation roughly 8:30 p.m.
Mike and Danielle Utley, South Metro Fire Fleet Services Bureau Chief Brian Brown and his wife Alice, Craig Hospital staff, board members, donors and supporters. Members of the press are invited to interview the award recipients, capture b-roll of the dinner and cover the award presentations. Please call or text Jordan Ames, Craig Hospital Foundation Communications Manager, at 720-231-0267 if you plan to attend.